Food identification could be done in many ways as Every food is different in many ways, like shape, color, size and taste as well as many other chemical and electrical properties. What if we build some cool project out of it? Electronics is a fun to play with. So we are going to make another fun project with it and we will try food identification this time. food identification could be simply done with resistance due to its chemical structure and iron in it. This makes it enough to create a fun project to identify different food according to their Resistance property. 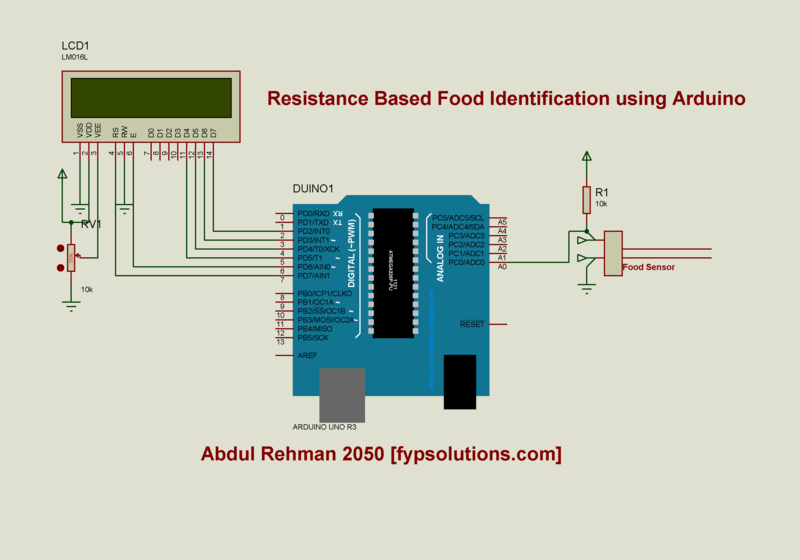 In this project we are going to build a Resistance Based Food Identification method which will identify and differentiate between food and later on this could also be used with vegetables as it give good results in cucumber and also strawberry. Apple and some other similar food keep changing once they are cut down or pealed out due to chemical reaction which happens due to interaction with air or some other environment factors. So you have to identify which food or vegetable are affected to these kind of or some other reactions. Due to this factor it is not possible to just have threshold for their resistance because that resistance may be changed after wards. Well Arduino as you all may already know is the best candidate for such projects as its open source and open hardware based and lot of other possibilities are to extend this project like adding some artificial intelligence or to build some game as this link did.